We're hearing a lot about virtual reality at the moment, but it's not a new idea. Let us give you a brief history of virtual reality. The idea of virtual reality (VR) has been around for a long time. Before computers were invented, even. The French playwright Antonin Artaudmentioned ‘virtual reality’ as far back as1936 (although he was speaking specifically about the theatre rather than technology). And a year before that in 1935, Stanley G. Weinbaum wrote of a goggle-based VR devicein his short story ‘Pygmalion’s Spectacles’ – a whole 77 years before modern VR headsets likeOculus Rift were conceived. 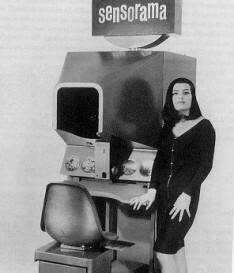 1962– Morton Heilig builds ‘Sensorama’, a projection booth with a 3-D display, stereo sound and a vibrating seat. It produces smells and sensations to takeyouon a virtual journey – through New York on a motorcycle (complete with the smell of hot dog stalls) was one of the ‘trips’ on offer. 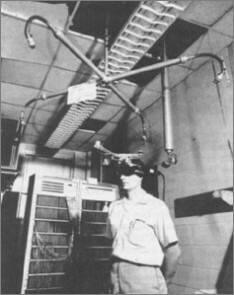 1965– Ivan Sutherland creates the first VR head-mounted display system. His device is so large and heavy that it has to be suspended from the ceiling, and its awe-inspiring (or terrifying) look gives it the nickname, ‘The Sword of Damocles’. 1969 -Myron Kruegere – one of the first virtual reality computer artists – helps create ‘GlowFlow’, a computer controlled environment that responds to the people in it. 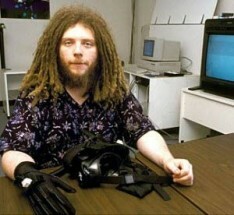 1984– VPL Research, one of the first companies to create VR products including its famous DataGlove, is co-founded by engineer Tom Zimmerman and dreadlocked VR pioneer and visionary Jaron Lanier. 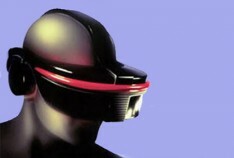 1987– Lanier coins and popularises the term ‘virtual reality’. 1991– Sega announces details of their Sega VR headset and console designed for gaming (although sadly, it never actually made it into the shops). 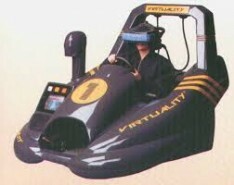 1992– The film Lawnmower Man follows a mentally-challenged man who is given superpowers through VR therapy. Writer and director, Brett Leonard, admits to drawing inspiration from companies like VPL. 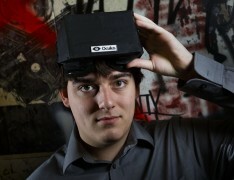 2011– 18-year old Palmer Lucky makes a rough prototype of the VR headset Oculus Rift. 2012– Oculus VR, the newly formed company behind Oculus Rift, launches a Kickstarter campaign to fund its development. 2014– Facebook purchases Oculus VR for $2bn. 2014– Sony announces Project Morpheus, a VR headset for the PS4. 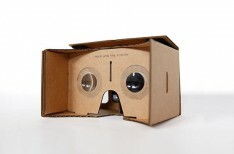 2014– Google announces details of Google Cardboard, a basic VR headset made of… cardboard. 2014– Samsung releases the Gear VR, a device that has no display itself, but uses the Galaxy Note 4 as a screen and computer. 2015– At MWC in Barcelona, HTC and Valve announce details of their upcoming VR headset, Vive. 2015 could be the year that VR takes off and changes the world. And if it does, you’ll hear all about it here at The Lowdown. Over to you… has VR changed your life yet? Are you looking forward to investing in one of the upcoming VR headsets mentioned above and taking your gaming to the next level? Feel free to comment below.